Develop the Vision for Your Organization! 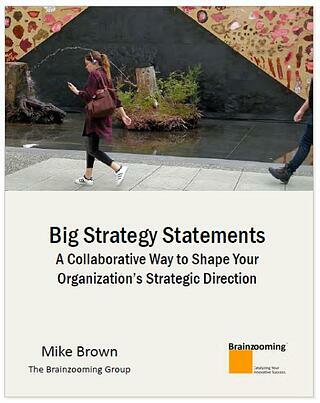 FREE Download: "Big Strategy Statements - A Collaborative Way to Shape Your Strategic Direction"
Never dismiss the value of a vision or mission statement for your organization. When you develop these types of strategy statements in smart, strategic ways, you will use them on a daily basis to shape decisions, priorities, and approaches to what you do and how you do things. This Brainzooming eBook reveals a proven methodology to evaluate your current strategy statements, correct ones that are repairable, and collaboratively develop new strategies that effectively guide your team today and into the future.